If you want to drive a vehicle that stands out from the pack, that gives you a commanding presence on the road, and that graces you with a sleek, luxurious exterior, then The Lincoln Motor Company is the luxury car builder for you. Originally founded by Henry Leiland in 1917, Lincoln was born as an aircraft engine builder, during the turmoil of the First World War. Since those early days, Lincoln has been synonymous with American, Presidential luxury. Named in honour of Abraham Lincoln, the Lincoln line of vehicles are driven by more Presidents than any other vehicle. Lincoln is a brand that truly offers “Power, Poise, & Peace of Mind”. The interior of the Lincoln Navigator is impressive. Many luxury vehicles can captivate your amazement, but it’s the details that put the Navigator in a hyper-luxury class of its own. Take the shift buttons in the center console for example; each button is modelled after a piano key, with the same weight to push them down as a concert grand. Featuring meticulously-designed surfaces and seating, this SUV boasts 42.3” and 40.9” of legroom in the second and third rows, respectively. In addition, the second row seating offers one-touch tilt and PowerFold® abilities, and the third row has PowerFold® which easily folds flat to provide increased cargo capability. In fact, the Navigator’s Tiered Cargo Management System has best-in-class cargo room. As you look upwards, the Navigator’s Panoramic Vista Roof® invites the world in and makes the already expansive interior feel even more spacious. 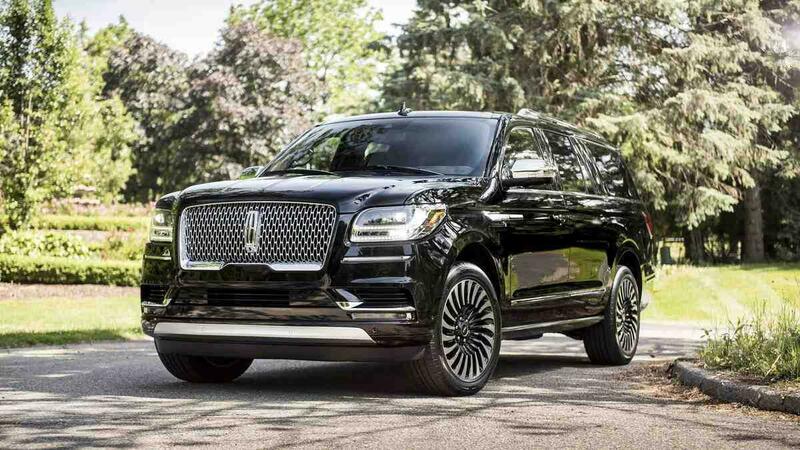 The exterior of the Lincoln Navigator is sleek and stylish and you can easily picture Matthew McConaughey beckoning you to sit in the passenger seat. From power-folding mirrors to available power-deployable running boards to the available illuminated grille that elegantly increases road visibility, the exterior packs a statement. The common theme behind the Navigator’s performance is power. The 3.5L Twin-Turbocharged engine, borrowed from the famous F-150 Raptor, offers 450 horsepower and 510 lb.-ft. of torque, so whether you want to get somewhere fast or tow something heavy you won’t have to worry. This amazing power is supported by a 10-speed SelectShift automatic transmission which helps to balance efficiency with performance. Driver satisfaction is key, and the Navigator offers a wide range of drive modes to enhance your driving experience. These adaptive modes include: Normal, Conserve, Excite, Slippery, Deep Conditions, Slow Climb, and Deep Sand. Just think about the fun you can have! Patented Ultra-Comfort seats come packed with features that a serious roadtripper could only dream of. Made up of 11 separate air bladders (seven of which offer a massage function!) these seats elevate comfort beyond the usual commoditized luxury of other car makers. The MKX combines a slightly smaller exterior size with more interior room for added comfort and delivers best-in-class second-row head and leg room. Similar to the Navigator, the MKX has an available Panoramic Vista Roof® and its genuine wood trim is available stunning Brown Swirl Walnut or Espresso Ash Swirl finishes. The MKX exterior wasn’t simply designed for elegance — it comes packed with advanced functional features that will impress. Coined ‘The Lincoln Embrace’, the MKX begins to operate even before you even enter it. As you approach, the interior lights will illuminate to greet you — you can even select from seven different colour settings to match your evening outfit — and when you leave, the auto-folding mirrors will tuck away. The MKX caters to your individual engine needs with a choice between the standard 3.7L TI-VCT or available 2.7L Twin-Turbocharged engine. The MKX also offers a range of adaptive technology to enhance its performance. These features include adaptive steering which continuously analyzes and updates speed and driver steering information to bring you the smoothest steering experience, and adaptive LED headlights to illuminate the twists and turns of the road as you steer, always giving you full visibility. Visit Wayne Pitman and take a 2018 Lincoln vehicle for a test drive — we know that once you take one out for a spin that you’ll love Lincoln as much as we do.